Conveniently located, this one level, 4 BR / 3 Bath Ketchum 2,200 SF home is a 10 minute walk to the River Run Lifts or downtown Ketchum restaurants, bars, and shops. GREAT ROOM: With six French doors leading to the Deck, Private Hot Tub and Backyard, the great room encompasses the kitchen, living and dining areas- as well as a cozy library. LIVING AREA: The living area features a 40" HDTV and Wood Burning Fireplace, perfect to watch football and/or relax by the fire. LIBRARY ALCOVE: For a bit of privacy and quiet, this small area with Internet Access, Printer/Scanner/Fax machine and desk is a great spot for those on a working vacation or curl up in one of the oversized chairs with a good book. GOURMET KITCHEN: The gourmet kitchen is beautifully equipped with high end Appliances, Granite Counters, and counter seating for three. DINING AREA: The adjacent dining area seats eight or head out to the Patio complete with a Gas Grill and teak furniture for meals under the amazing blue sky. 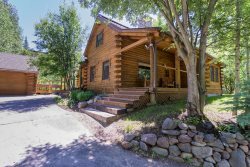 Skiing, Fly Fishing, Hiking, Biking, Golf, Tennis, or more- it's all steps away from this Ketchum Luxury Log Lodge!